I would like to bring to your attention St. George Orthodox Church (Russian Orthodox Church Outside of Russia) in Cincinnati, Ohio. I encourage you to do what you can to help them out. If you’re on Facebook, you can join the group titled, appropriately enough, “I just donated $20 to the St. George Building Fund will you too?” If you’re not, you can just just click here and find out everything you need to know about their building project and how to give online quickly and easily. I’m particularly appreciative of their attempt to raise a small amount of money from thousands of people rather than large amounts of money from a small number of people. If it works for them, it could work for All Saints, too — so help make it work for them! And yes, it’s true, we’re a bit stressed right now. Let me just pass on a few reasons why, in hopes that it gives you some perspective. 1) We’ve got a week coming up full of services for which we’re responsible, we don’t have a clue who is going to be at any single one of them to help, and we probably won’t know entirely until about 15-20 minutes into each service. 2) There is no Paschal rehearsal schedule that can adequately cover the reality that no more than half of the choir is likely to be at any rehearsal. This means there is no amount of rehearsal that can prevent some number of trainwrecks, because inevitably the potential trainwreck spot you covered at rehearsal A was the rehearsal that persons B and C, most prone to trainwrecking at that particular spot, did not attend. This also means that all of the musical things you hoped to do something with, no matter how much you rehearsed them, are going to be useless because not everybody was there to rehearse those bits, and the people who weren’t there will just sing what they’re used to singing, regardless of how you try to conduct it. 4) There is no Paschal rehearsal schedule that covers the fact that the music that you do lives way too high for your tenors and sopranos, but if you repitch it will be too low for your basses. The alternative, different music that would be appropriate for the singers you have, would get you your head handed to you by the people who have an emotional connection to this music that is incomprehensible to you. 5) It’s Lent, so just like everybody else, we’re fasting and struggling too, in addition to the above points. 1) Come to every rehearsal and every service, tell us if you’re coming or not coming so that we know in advance, come on time, and encourage everybody you know to do the same. I know you’re busy. So is everybody else. So am I. If you’re sick or have to be out of town, that’s one thing. If you’re of the opinion that you have better things to do than rehearse, then why are you in the choir in the first place? 2) Do not think, “It doesn’t matter if I’m missing.” Yes, it does. I have had to cancel rehearsals this Lent because enough people have just not bothered to come for the time to be productive. 3) If you’re part of another ministry that meets during what is the choir’s normal rehearsal time and has a significant overlap of membership with the choir, please bring up the possibility of rescheduling those meetings during Lent so that we aren’t having to hold rehearsals with an even more severely compromised membership than usual. See point of crankiness #2. 4) Ask your friendly neighborhood choir director, “What can I do to help?” We don’t hear that nearly often enough. 5) Last but certainly not least, please pray for us! These next ten days or so of all days. Um, yeah, so about the Edward James Olmos lookalike with the very intimidating fake moustache… well, never mind that now. One of the really interesting things about the film is how it presents the venue of the music changing over the years and how people are presented as engaging with the songs. In the first extended musical scene after the Asia Minor tragedy, we see the band right in the middle of the audience, and the people reacting to the music in ways that show it is very much a way of dealing with a shared pain and sense of mourning. The members of the audience weep, they dance, they drink, they slash their wrists, they punch things until their hands bleed — the music means, and functions as, a kind of catharsis. It isn’t pretty, but it’s real and unvarnished, and it matches closely with songs that are about prostitution and drugs and in general about the seamy side of the life they are all sharing. As time goes on, the band becomes a little more separated from their audience. The music is still on the darker side (the song in the above clip is about, and is being performed at, a hash bar), but it is becoming more formalized, and it is more self-consciously “performed” and “listened to”. There’s a scene where a singer tells her manager that she can’t sing comfortably even as close to the audience as you see in the clip; she’s got to be farther away still. The music is starting to become “entertainment”. At the end of the movie, in the late 1950s, a tribute concert is staged for a particular singer, and this is where the transformation is complete — the singer and the band are on a stage in front of rows of seating. However, it isn’t just the performers who have become self-conscious — now the audience is getting into the act. Rather than dancing or drinking or smoking or in general using the music as an outlet for pain, now the audience is singing along cheerfully and clapping to the exact same songs they were literally shedding blood and tears for thirty years ago. The music no longer engages memories of a shared tragic past — the music engages memories of the music itself. Really, what it has become is an exercise in nostalgia. The music no longer means what it used to mean — now the singers and audience members are remembering what the music meant. As such, I would argue that, despite a communal action more closely coordinate with the onstage action (i. e., singing along and clapping), they are actually not participating so much as they are remembering the time when they used to fully participate in a way that engaged what the music means. Which brings me to a particular experience I had during a service recently (for various reasons, I do not wish to identify which service or the precise time when it occurred). As of late, one of my colleagues at the kliros has taken to singing a particular hymn in a language other than English (for the same aforementioned reasons, I’d rather not get any more specific than that). This is something that this particular cantor used to do back in the early days of All Saints; for reasons I won’t go into, he stopped this practice for awhile, but he has reintroduced it when he’s singing. I don’t have a problem with it; a rather tight leash has been put on me when it comes to liturgical languages, and I abide by the restrictions that have been expressed to me, but this gentleman is able to do it and get away with it because, well, he can, and nobody really wants to fight with him. Well, at the point in this service where this particular hymn is sung, my cantorial counterpart asked me, “Do you want me to sing it?” I indicated that yes, I did, which was overheard by somebody else in the congregation, another founding member of the parish. This prompted this person to run over to the kliros and join in for just this particular hymn sung in this particular language. Once the hymn had concluded, the drop-in psaltis clasped their hands, sighed “Beautiful,” clapped my colleague on the back, thanked me for letting them stand there, and returned to their chair. I am still trying to figure out exactly what happened and why. I do not say that to be critical or condescending; what this person did is just not something that would ever occur to me to do, having sung in church for almost half of my life. Perhaps, as in Rembetiko, what we’re talking about is “participation” manifesting itself as “nostalgia” (or should that be vice versa?). I rather got the sense of two people engaging the hymn as a way of remembering what All Saints was like 20+ years ago, when they met in a borrowed space and still had 300 people for Easter. I don’t relate to the giddy excitement about this particular person singing this particular hymn in this particular language, “just like we used to do years ago,” because I wasn’t there. I don’t, nor can I ever, have the emotional attachment that is in play there. I’ve been there all of seven years, which is the longest I’ve ever spent worshipping with the same congregation, but which pretty much makes the “But we always used to do it this way” argument incomprehensible to me when I’m talking to people who helped start All Saints. I don’t know if that kind of nostalgia is a legitimate argument for a particular liturgical practice one way or the other; I just know I don’t share it, and I approach my own participation in the services looking through a very different set of lenses. What that means, however, is that when I hear “But we always used to do it this way” and try to answer it with “But the service book actually says this,” more often than not my interlocutors and I wind up talking past each other. Perhaps we can say that it is because I am trying to function according to how I understand particular things mean; others are functioning according to their memory of what things meant. 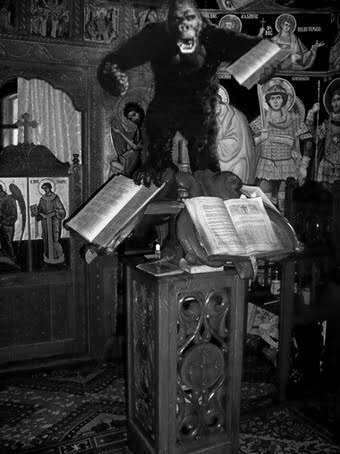 My only other thought is that my instinct is to want to resist nostalgia; there is an element of interaction with the past in our liturgical practice, yes, but as Orthodox liturgy is also eschatological we also interact with time yet to pass. To the extent that we interact with the past we do so with the shared Christian past — that is, Tradition. The other side of that is that I say that as somebody who has never been involved with the founding of a mission, so I fully concede that my perspective is exactly that — my perspective. That and $4 will you get you a soy latte at Starbucks. I suppose that in a historically Orthodox country, this is a dynamic that would ultimately be self-regulating; here, it’s rather more complicated. My assumption is that in a relatively isolated community like ours, what we’re talking about probably will take two or three generations to work out.